The operational range of the Turkish Central Bank will be expanded through strengthening policy synchronization and unclogging congestion in structural canals in price stability and by combatting inflation, the nation's treasury and finance minister said on Thursday. "A central bank more effective than ever will be among our policy's main targets in the new era," Berat Albayrak told Anadolu Agency. Albayrak underlined that it is improper to speculate on the bank's independence and decision-making mechanisms. Speaking at a NATO summit, the alliance’s chief on Thursday said that Georgia will join its ranks.At a joint press conference in Brussels alongside Georgian President Giorgi Margverlashvili, Jens Stoltenberg said that the allied leaders reaffirmed the move on Wednesday.Praising the progress Georgia is making on reforms, Stoltenberg said that NATO will continue to work with its government to prepare the country for membership.Earlier, during a joint press conference with Ukrainian President Petro Poroshenko, Stoltenberg said that the situation in eastern Ukraine remains "serious".France will meet NATO defense spending goal by 2024Trump claims victory after forcing NATO crisis talks"NATO is firm in our support for Ukraine’s sovereignty and territorial integrity. And we strongly condemn Russia’s illegal annexation of Crimea," he added.Russia’s 2014 illegal annexation of Ukraine’s Crimea region led Western powers, including the U.S., to impose sanctions on Moscow.Along with the UN General Assembly, the U.S., the EU, and Turkey also do not recognize Crimea as Russian territory.Since the annexation, Ukraine has been wracked by conflict in its eastern regions with Russian-backed separatists, leading to more than 10,000 deaths, according to the UN.Trump tirade sends NATO leaders into crisis sessionA two-day NATO summit started on Wednesday with the attendance of 29 NATO heads of state and government to make important decisions on the future of the alliance.The summit is discussing important decisions on the alliance’s future and other major topics, including strengthening deterrence and defense, counter-terrorism and stability, strengthening cooperation with the EU, modernization, sharing responsibility and common values, and the transatlantic union. "In the new era we will support the Central Bank carrying out a more predictable, straightforward, and decisive monetary policy," said Albayrak. "Our policies will be determined within the scope of a sustainable and consistent growth target by prioritizing budget discipline, structural reforms, and single-digit inflation," Albayrak said. Albayrak added that their main priority will be reducing inflation with the help of monetary and fiscal policies. U.S. President Donald Trump said on Thursday a meeting with Russian counterpart Vladimir Putin next week may be the easiest on his Europe trip, saying Moscow was a competitor and not an enemy.Asked if Putin presented a threat, Trump said, "I don't want him to be and that is why we have NATO," following a summit of the military alliance in Brussels. "He is a competitor," Trump told reporters. "Is he my enemy? He is not my enemy ... Hopefully someday maybe he will be a friend. I just don't know him very well. "Trump said he would raise issues of arms control, extending new start treaty, and Russia violations of INF treaty in Putin talks. "We go into that meeting not looking for so much. We want to find out about Syria. We will be talking about meddling ... We will be talking about Ukraine." "We will take necessary steps to first bring down inflation to single digits then reach the country's targets." This June consumer prices in Turkey rose 15.39 percent compared to the same month last year, the Turkish Statistical Institute (TurkStat) announced on July 3. As noted in the country's medium-term program (MTP) introduced last September, inflation is targeted to converge to 5 percent through the end of 2020. 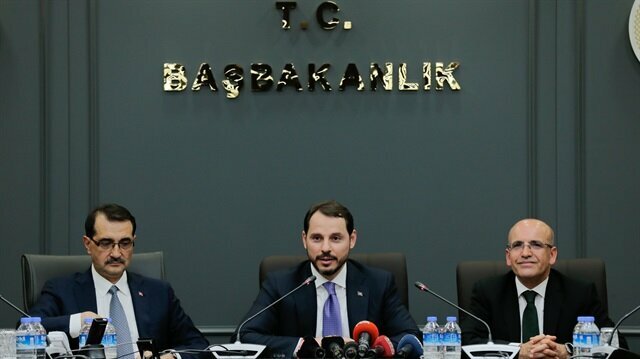 Albayrak said the ministry will implement effective fiscal policies which provide budget balance in line with the MTP targets while making no concessions from fiscal discipline.